Poke cake is one of my all-time favorite summer desserts. 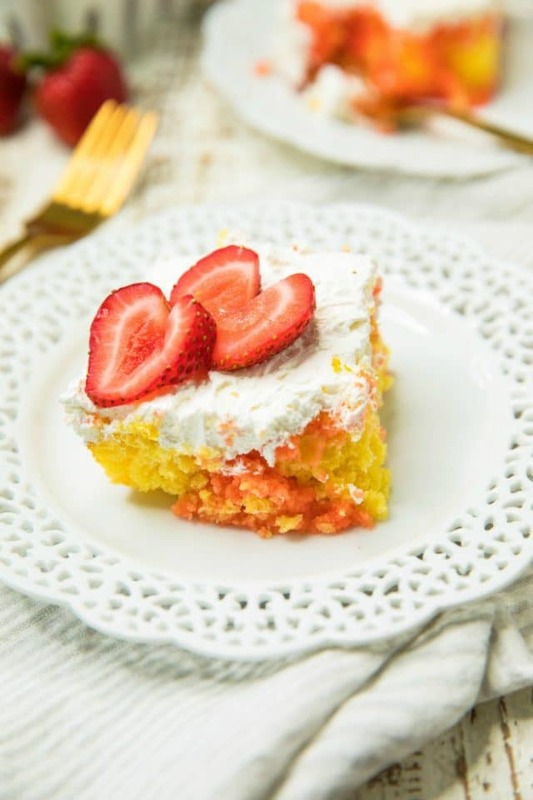 With a combination of lemon and strawberry flavors, this Easy Strawberry Lemonade Poke Cake is sure to become one of your favorites too! What’s great about poke cake is you can change out the cake mix and gelatin to get whatever flavors you’re craving. 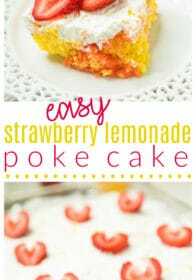 I’ve had some pretty awesome poke cakes in my time, but I have to say the Strawberry Lemonade Poke Cake is #1 in my book! Another thing I love about this cake is how simple it is to prepare. 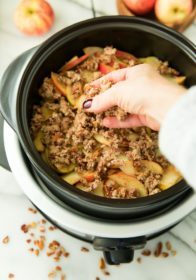 It’s so easy that you can get the kids in the kitchen to help! 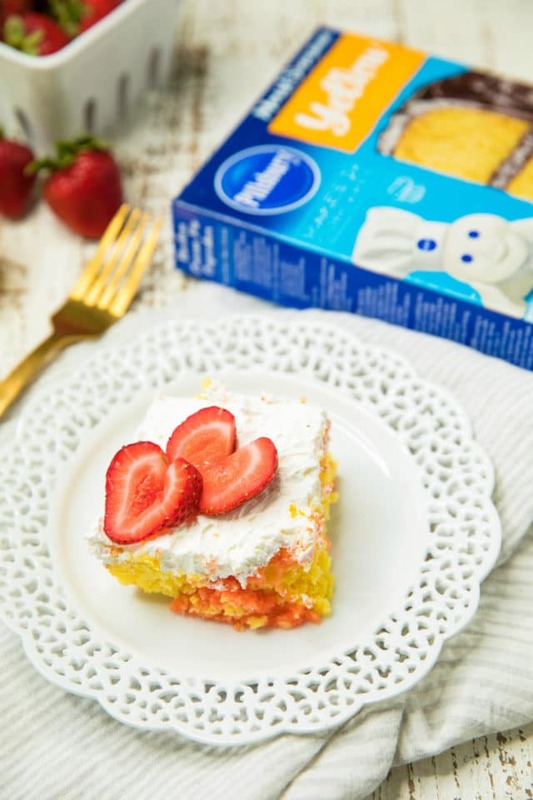 Pillsbury™ Moist Supreme Yellow Premium Cake Mix (oil and 3 eggs too) – You can find it at Kroger, down the baking aisle. It’s my go-to for the best flavor and texture. Lemon-flavored Instant Pudding & Pie Filling and Strawberry Gelatin Dessert – Both also down the baking aisle. Madelyn enjoyed pouring the cake ingredients into the mixing bowl, but her favorite part was poking holes into the cake. Don’t worry, you don’t have to keep it neat and uniform. Poke away, and then the fun part is cutting into the cake and seeing all of the pretty pink color from the strawberry gelatin. Poke cakes are even better if you let them chill in the fridge overnight before serving. 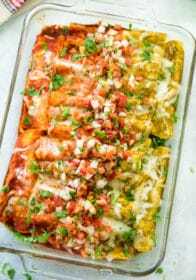 Use a 9X13 baking pan for this recipe. It’s the optimal size because the cake rises quite a bit and the cake will overflow in a smaller cake pan. If you don’t have that size, you can divide the batter into two square 8″ pans. 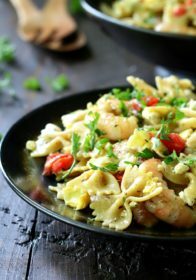 Looking for other yummy summer recipes? 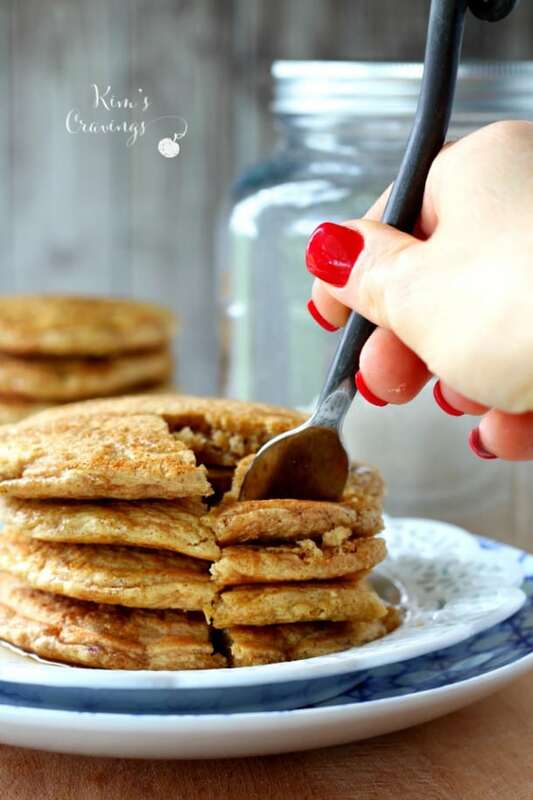 Head over to the Pillsbury brand page on the Myxx recipes website to find many more! 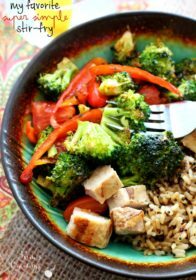 And I have lots of summer recipes here too! 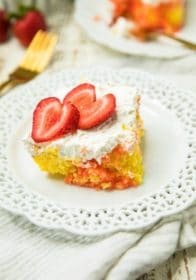 Check out the video, below, to see just how simple this Easy Strawberry Lemonade Poke Cake is! 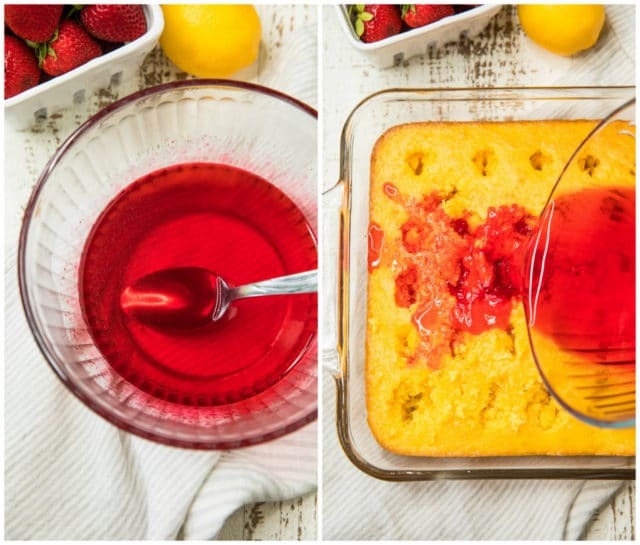 An easy, delicious summer dessert! In a medium-sized bowl, combine cake mix, dry pudding mix, water, oil, eggs, lemon zest and lemon juice. Beat on medium – high speed until all ingredients are well blended. Use a spatula to mix the batter from the bottom of the bowl to the top. While the cake is still warm, take the end of a wooden spoon or another round object and poke holes all over the top of your cake. Allow to cool for 20 minutes. While the cake is cooling, dissolve gelatin in boiling water in a small bowl, stirring constantly. Once gelatin is dissolved, pour mixture slowly over entire cake. Let the cake chill in the fridge for about 45 - 60 minutes. Once cake has chilled, combine lemon juice and whipped topping. Spread evenly over the top of the cake. 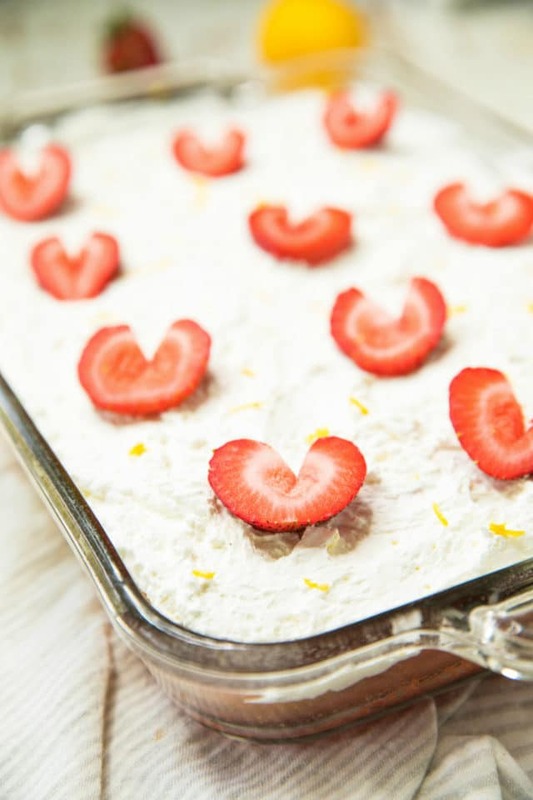 Add sliced strawberries and lemon zest over the whipped topping. Chill until ready to serve and enjoy! Such a lovely presentation. This cake is perfect for summer pot luck parties. I can’t do outside for long in crazy summer heat either! This looks perfect for an easy summer dessert. 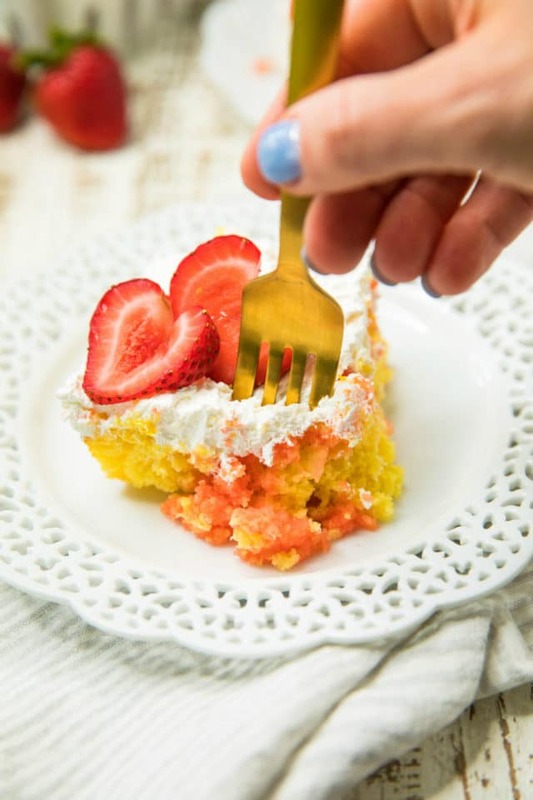 I like that you are using both strawberry and lemon flavors in this poke cake. My whole family would love a piece of this cake! Yum! pretty too. Love it. Yum! This would be perfect to make for my daughters upcoming birthday, a nice refreshing summer flavor. Those heart shaped strawberries are excatly how I feel about the post. You do take some “delectably” tempting pictures! Oh wow that sounds delicious! I’ve never heard of this style of cake before but I love strawberries and of course I love cake! yum! Ooh this sounds delicious! I’ve never had a poke cake actually but I would love to try one. And I love the final result, it looks very pretty with the splash of strawberry through it. You had me at the very first pic, it looks so delicious and it’s pretty easy to make. I would love to give it a try. Thanks for the detailed recipe. Totally loved the post. I’ve never even heard of a poke cake but I’d love to “poke” my fork into it! It looks like the perfect, light summer dessert. Oh this sounds easy enough. I think I can do it this weekend. I hope I can find some nice strawberries. We don’t always have stocks around here. I love the sound and look of this cake. I have never tried this cake flavour before. It looks very delicious. Sounds very easy to make and I think this might be the perfect cake for Summer. well that’s a great tips and a lovely strawberry lemonade cake too. I find your presentation of the cake was really cool..
Wow your lemonade poke cake looks delicious and perfect for snacking. 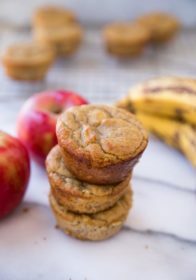 Will print your recipe! That sure looks delicious. Hope a newbie like me can manage this one. Will try this over the weekend and keep you posted. Thanks for sharing! That sounds so good! The pictures are amazing! I’m going to have to try it! Hopefully I can make it! Oh my gosh yes please. This looks incredible. 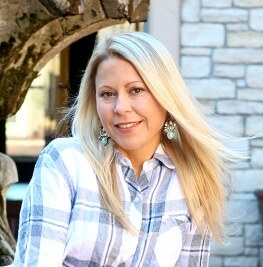 I need to get my baking apron on and get back in the kitchen! 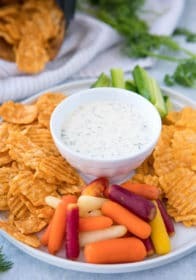 Mmmmmm that looks amazing! I really love anything with strawberry! I would definitely love to try that.